Rod Rosenstein has tendered his resignation. One had to know Rosenstein lied, when he denied the allegations. That’s just DC swamp rat politics. The president became aware of Rosenstein’s comments last week, and he would have every right to fire the man. President Donald Trump says he has not decided whether or not to fire Deputy Attorney General Rod Rosenstein, saying he wants to see the “facts” behind claims that Rosenstein talked about wiretapping the president and possibly seeking to remove him from office. 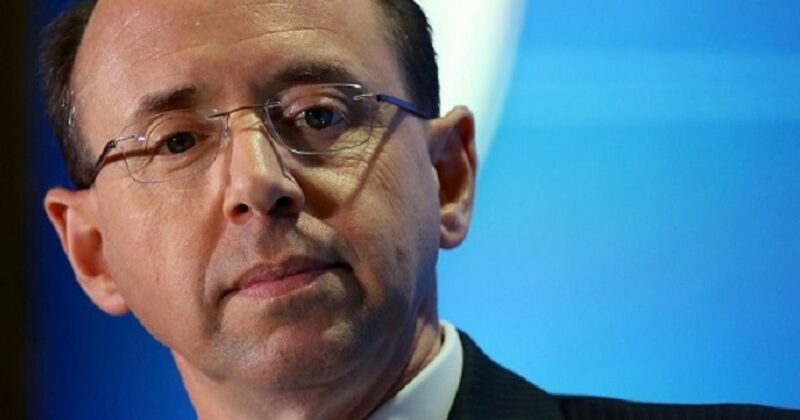 Apparently Rosenstein wanted to get ahead of the game, and say he broke up with President Trump. Or he could be pulling a “McCabe” and trying to preserve his pension. Regardless, American politics has crunched another DC cockroach if indeed Rosenstein resigns. But the question begs, “What next?”. What will Sessions do, now that the Chief Interference Officer for the Trump administration can no longer provide cover for Democrats? Will Sessions appoint a Trumpster? Or will he pull some bonehead move, and allow another swamp rat to fill the void? If he does the former, perhaps we can get a true American in the position, and he or she will appoint a special counsel to investigate the current special counsel! Even if that doesn’t happen, perhaps we can just get to the bottom of the Democrats’ attempt to thwart our last presidential election, and the attempted coup that followed? That’s certainly not too much to ask.